Sri Lanka should seek trade relationships with foreign countries so that the search for emerging markets would not be an issue. On the other hand, it will create many employment opportunities and attract foreign exchange to the country, said Managing Director, Ozbiz Export Aid FZC, Ananda Rajapakse. Q: What are the potential markets for Sri Lankan products in that region of the world? A: The United Arab Emirates(UAE) countries, Abu Dhabi, Dubai, Sahajah, Ajman, Rasal-Khaima and Al-Qawain especially the Gulf Cooperative Countries (GCC) consisting of Bahrain, Oman, Doha, Qatar, Kuwait and Saudi Arabia can be lucrative markets for Sri Lanka’s exports. In those countries the GDP per capita is as high as US$ 30 and their imports are almost US$ 100 billion per year. Hence, Sri Lanka could export any thing - from bottled water, toilet tissues to construction materials, as the UAE countries are the best market. Q: What are the facilities available for a Sri Lankan to go to the UAE and set up business? A: There are few Sri Lankan companies which have already stepped in to international business in those countries. They have set up 100 percent Sri Lankan companies in the free zone of the UAE without foreign partners. Such companies are given 50-year tax free holidays, 5 percent VAT and are encouraged with residence visas for directors of the companies. Three new airports are being constructed in Jebal Ali, Doha Qatar and Abu Dhabi providing more facilities to manufacturers in those areas. A scheme called Qatar Development Fund for manufacturers in Doha Qatar encourages many Sri Lankans to set up factories there. 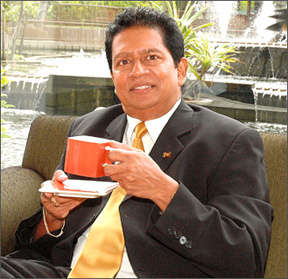 Managing Director, Ozbiz Export Aid FZC, Ananda Rajapakse. Q: Do you think that investors in those countries would like to invest in Sri Lanka since the situation in the country is healthy at present? A: Of course they would go anywhere, where they can earn money. Their trade surplus exceeds US$ 500 billion per year. Some companies such as the Aspire (tertiary education) companies have already set up branches in Sri Lanka. Investors in those countries would come to Sri Lanka if they see an opportunity to earn money. Hence Sri Lanka has to explore this area to attract investors. Q: With the economic meltdown many countries in Europe faced an economic crisis. Has this affected countries such as UAE/GCC? A: The economy has been affected when one considers certain sectors such as administration, marketing and construction of apartments in that region. The main reason behind is that they don’t spend money on constructing apartments since there has been a slowdown in the number of tourist arrivals. The UAE has a better economy even today compared to England, Japan and China. The Gulf has targeted 150 million tourists by the year 2020. They have not ceased the construction of infrastructure such as bridges or airports. They are getting ready for the next wave of economy and will start moving again. They have been pumping their surplus money in to their markets. Q: What are the areas they can invest in Sri Lanka? A: Tourism is a lucrative industry for them. On the other hand they could be attracted by tourism itself. That would result in the development of tourism in Sri Lanka. Whenever they visit a country they look for good hotels along the seaside, so that they can sleep late and spend time on the beaches. The Ozbiz Export Aid FZC intervenes in contracting interested companies to set up their regional headquarters in Gulf countries. The freedom to transfer profits tax- free at any time as well as the stable political and financial system, quality workforce continues to make Dubai even more attractive to local and foreign investors. Q: How is Sri Lanka’s image in the UAE countries? A: Sri Lanka and Sri Lankans are highly respected. The Quantity Surveyors produced by Sri Lanka are mostly appreciated. Q: What is your advice for young people to start a career in business? A: When a young person finishes his/her Advanced Level examination, there is ample time for him/her to get work experience. One may not get a good salary but can gain work experience. In that manner, one has to work with other people in a working environment. Young people should think as entrepreneurs who create jobs. The education system in Sri Lanka encourages every child to study and seek a good job. Today it should be vice versa and young people should become job creators at a very early stage. A: I like to travel to countries which I have not visited. I also spend my leisure by window shopping in shopping malls. I enjoy ballroom and Latin American dancing. I also spend time in reading. Q: What is the best place you wish to visit outside Sri Lanka? A: I like to visit the USA where I feel at home since my family lives there. Q: What is the best place you wish to visit in Sri Lanka? A: Sigiriya is my favourite place since it inspires creation.